The First World War is rightly seen as engendering some of the greatest and most avant-garde art and poetry of the twentieth century. But Pallant House has chosen to highlight another conflict that – without any official impetus – spurred a significant cross-section of British artists to create striking and progressive work. The Spanish Civil War brought political developments in Europe to a head in 1936-9, and was seen by most as a testing ground for the newly powerful ideologies of Fascism and Communism. This exhibit ion brilliantly illustrates the response of British artists to this threat – whether overtly political or more philosophical, actively propagandist or contemplative – in a wide range of media that gives an immediacy to their work. 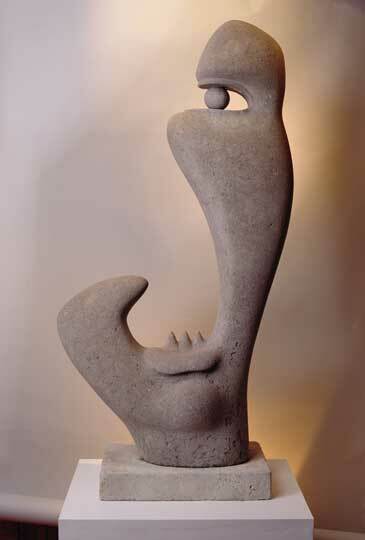 Moreover, many are relatively unknown artists whom it is a pleasure to discover more than holding their own amongst famous names such as Henry Moore. 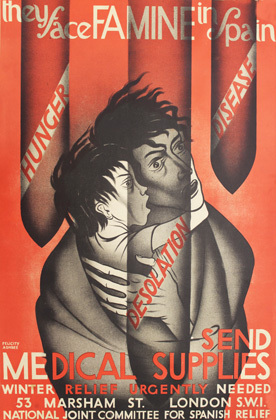 Felicity Ashbee, for instance, whose hard-hitting posters urging aid for the Spanish people (above left) were deemed too much for London Transport passengers. Frank Brangwyn’s design (above right) appears dated in comparison, its Madonna-like central figure at odds with the Republican cause he promotes (Brangwyn was a Catholic, yet in Spain the church had sided with Franco’s Nationalists, while the Republican anarchists were accused of atrocities against religious buildings and clergy). 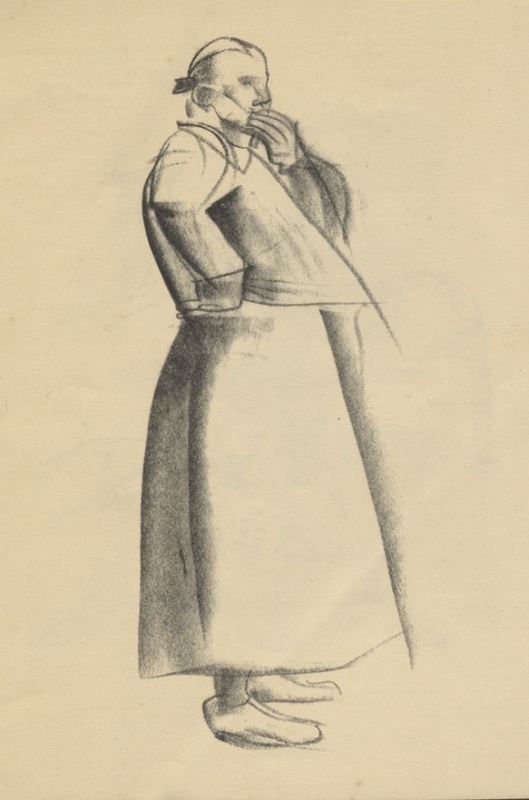 And Felicia Browne, the only British woman to fight in the war and the first to be killed in August 1936, is represented by sketches of Spanish peasant women (left, 1936) which were exhibited posthumously in London to raise money for the cause she had died for. Clive Branson is another name that is new to me, and on purely aesthetic terms his naive proto-‘kitchen sink’ style does not appeal. However, in this context his paintings illustrate the political passions aroused by the Spanish cause. 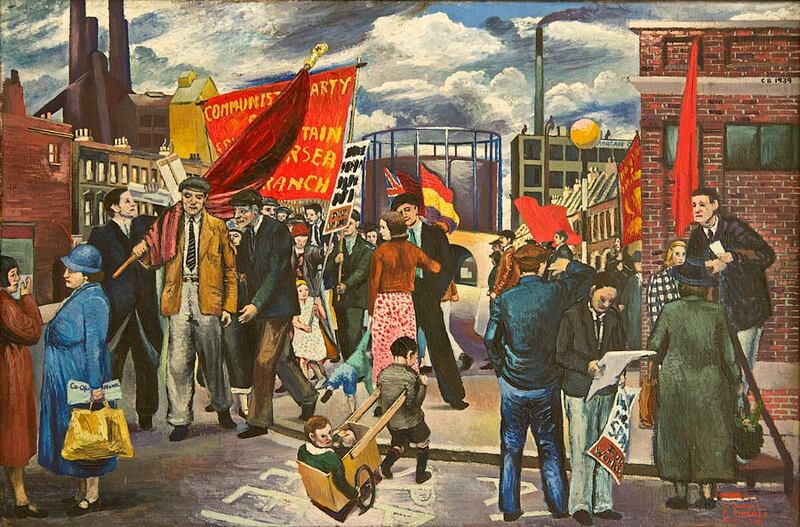 Branson, a staunch communist who fought with the International Brigade in Spain, saw the conflict as part of a wider struggle for worker’s rights, and pictures such as ‘Demonstration in Battersea’ (below, 1939) or ‘Selling the “Daily Worker” outside Projectile Engineering Works’ (1937) link the immediate cause of unity against Fascism in support of the Spanish Republic with the unity of workers against capitalism (the pertinence of the Projectile factory in the latter painting being that the workers are building the bombs that will be used to destroy them). From Realism to Surrealism… The outbreak of the Spanish Civil War coincided with the International Surrealist Exhibition in London in 1936, and though the movement was ostensibly concerned with depicting the subconscious and the dreamlike, many who showed at that exhibition were to engage – perhaps obliquely – with the unfolding tragedy in Spain. The room is dominated by two large scale paintings: Edward Burra’s ‘Medusa’ (left, 1938) and S.W. Hayter’s ‘Paysage Anthopophage’ (below, 1938). Burra’s mythological monster stands amid a ravaged landscape of ancient ruins with a cloak of dead bodies slung over one shoulder; it is a chilling and deeply unsettling image that conveys all the sense of dread that Burra had experienced briefly in Spain in early 1936. Hayter’s painting is more metaphorical, drawing parallels with ‘The Siege of Numantia’ by the Romans in 133BC (recounted in a play by Cervantes). Despite the bright abstract shapes, there is an impression of searing heat and the sinuous bodies sprawled on the arid ground stand out in tragic finality. 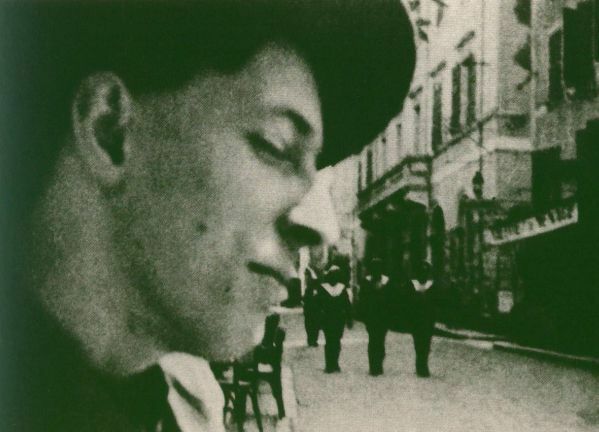 A collage by Roland Penrose seems less relevant, though perhaps draws attention to the crucial part the artist himself played in both the surrealist movement and in focusing public attention on the plight of Spain by enabling Picasso’s ‘Guernica’ to be shown in London. Andre Masson and John Banting both contribute surreal satires on the morally ambiguous role of the Catholic church in the war. It wasn’t just through painting, however, that the surrealists took made their views known; photographs and ephemera recount their political declarations and show Penrose and others wearing Neville Chamberlain masks designed by the sculptor F.E. McWilliam on the May Day march of 1938, in protest at Britain’s non-intervention policy. F.E. McWilliam is also represented by ‘Spanish Head’ (right, 1938-9), its features reduced to a single piercing eye and a scream that from the bared teeth seems to resonate upwards into space and time. This makes an arresting companion piece to Picasso’s ‘Weeping Woman’ in the next room; Picasso’s ‘Guernica’ (1937) was and is seen as the seminal artistic response to the Spanish Civil War and ‘Weeping Woman’ is a continuation of this theme, an image of universal suffering. Roland Penrose, having organised the exhibition of ‘Guernica’ in London, bought the painting and both these images had a significant impact on British artists both politically and stylistically. ‘Guernica’ depicted the impact of the first full scale aerial bombing of civilians, and this now loomed as a potential threat to any city that came into conflict with Fascism. 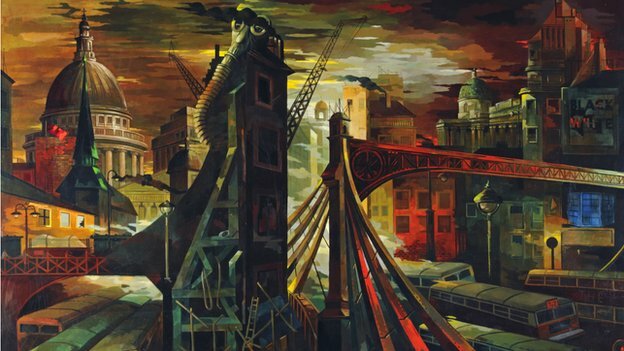 Walter Nessler’s powerful ‘Premonition’ (left, 1937) sums up the attitude that prevailed post-1937, its ominous red light outlining a shadowy urban landscape of ruins culminating in a gas mask keeping watch over the distant pinnacles of St. Paul’s and the National Gallery. Merlyn Evans’s brooding tableaux of abstracted mechanical figures in metallic colours embody the same sense of an inhuman threat. 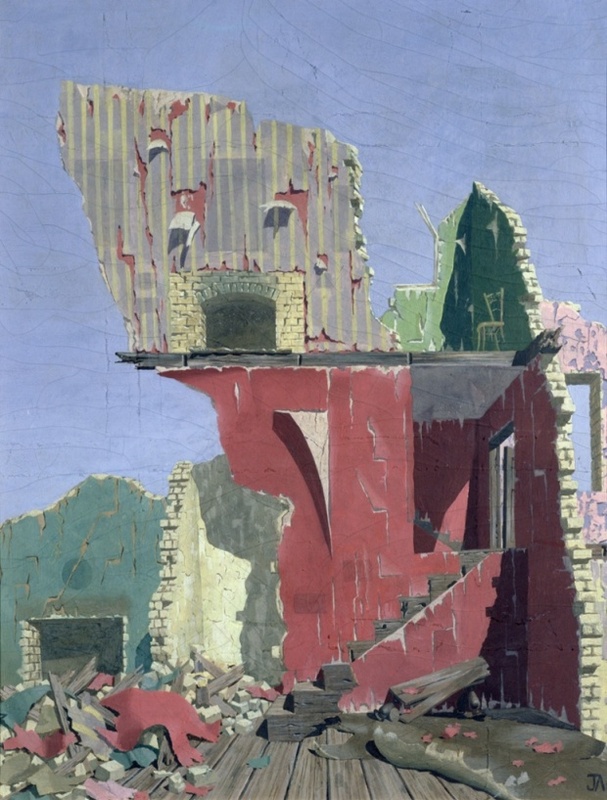 In contrast, John Armstrong’s tempera paintings in bright pastel colours evoke a sense of pathos; still and silent in the blazing sunlight, they depict the empty ruins of Spanish homes, wallpaper torn, fireplaces cold and abandoned, as in ‘Revelations’ (right, 1938). The V&A, in an unusually controversial move, chose this moment to exhibit Goya’s series of prints ‘Los Desastres de la Guerra’; depicting the horrors of the Peninsular War in 1807-1814 this was considered a direct parallel to the current conflict, a comparison to which a number of artists responded. Of these, the two artists shown alongside a selection of Goya prints were interestingly either pro-Nationalist or ambivalent. 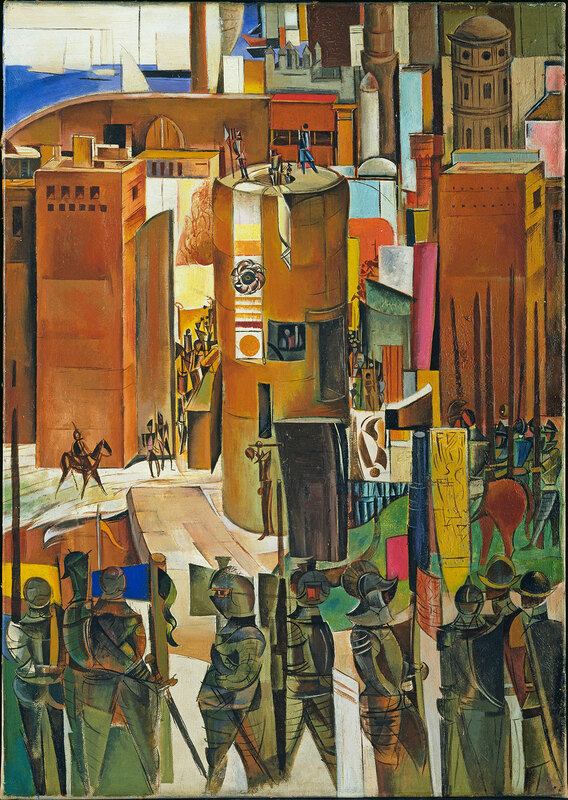 Wyndham Lewis began painting ‘The Surrender of Barcelona’ (left, 1934-7) before the civil war broke out; he described it as a 14th century scene, with the frieze of soldiers in the foreground believed to refer to Velazquez’s ‘Surrender of Breda’ (1635), but pertinently he changed the title from ‘Siege’ to ‘Surrender’ as Barcelona, long the stronghold of the Republicans, finally fell to Franco’s forces in 1939. 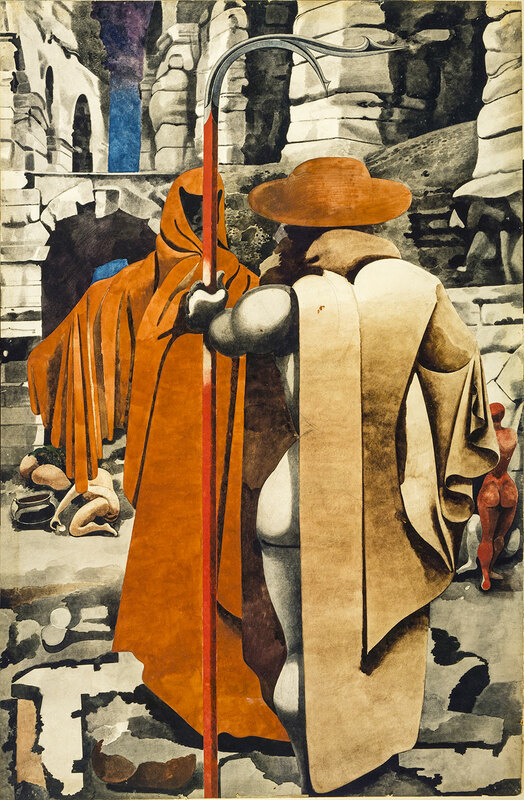 Meanwhile, Edward Burra’s ‘The Watcher’ (right, 1937) depicts a sinister hooded and cloaked figure facing another with his back to us holding a two-pronged scythe amid a landscape of imposing ruin. Burra is sometimes described as pro-Franco but was in fact apolitical, deeply affected by the burning of churches he had witnessed in Spain. His paintings of this period reflect his horror of the violence and suffering inflicted by both sides, their ambiguous and theatrical historicising enabling the artist to distance himself from the situation. The final room considers the plight of those affected by the violence – the prisoners and refugees. 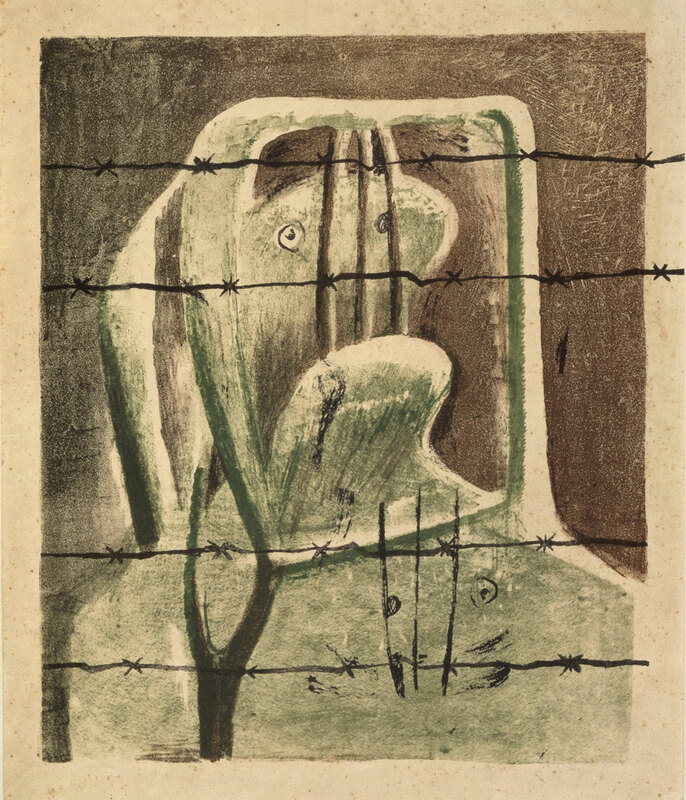 Henry Moore’s sculpture ‘Helmet’ is accompanied by his designs for a poster (‘Spanish Prisoner’, left, 1939) that was in the end abandoned as world war erupted in 1939. 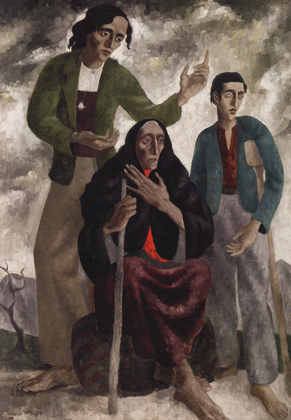 Ursula McCannell, hailed as a ‘child prodigy’ when she first had her work exhibited aged thirteen, had visited Spain early in 1936 and back in Britain painted stark, almost biblical, images of emaciated Spanish refugees in the style of El Greco or Picasso’s Blue Period (‘Family of Beggars’, below right, 1939). 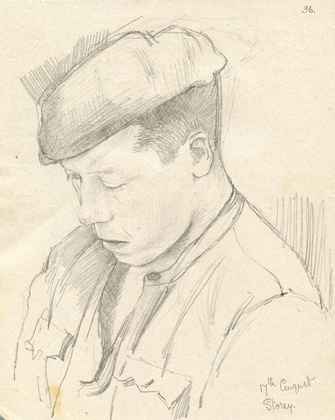 Clive Branson was himself a prisoner of war in Spain, and produced both small oils of the landscape he could see from the camp, and touching pencil portraits of his fellow prisoners (below). Back in Britain, a ship full of Spanish children arrived on the south coast in 1937 where they were put up in hostels. Edith Tudor-Hart photographed them at play or happily peeling vegetables; they might as easily be scenes of an annual scout camp, but in the context it was a poignant message that Britain had finally intervened to help in some way improve (or perhaps save) the lives of these children. Among all these various pictures and sculptures are documents and artefacts, propaganda posters and banners, which give a rounded view of the efforts of British artists in all fields to raise awareness and support the cause of the Spanish people. Beyond this multifaceted history, the appeal of the exhibition lies in the unusual and fascinating mixture of artists brought together by their involvement with Spain, artistic hierarchy put in second place to passion and spirit. The later response to the Spanish Civil War, including artists such as RB Kitaj in the 1960s, I felt irrelevant and uninteresting; however, I was thrilled to find a room in the permanent collection dedicated to Spanish paintings – mainly of the same period though not related to the war – by artists such as David Bomberg, Walter Nessler, John Banting, William Nicholson and Muirhead Bone. This made a stunning accompaniment to the show and a tribute to a beautiful, if betimes ravaged, country. What, if anything, is the legacy of British Modernism in British art today? Modernism, and its British manifestation especially, is much disputed still. The movement is positioned vaguely in the late nineteenth and early twentieth centuries; the influencing factors identified as industrialisation, urbanisation, and increasing aesthetic introspection. The modern in art has generally been associated with the breakdown of the Western tradition of art mirroring nature – a tendency that appeared concurrently with the rise of nationalism in Europe. The Impressionists started to fragment their brushstrokes and give priority to atmospheric effect just as Italy and Germany formed nation states; and so, as the Serbs demanded independence and the Austrian Empire teetered on the brink of shattering into its component ethnic groups, Cubism flourished and Kandinsky claimed to have reached true abstraction in painting. But Britain stood apart both from the cutting edge of European modernism in its move towards abstraction and from the radical redrawing of national boundaries. 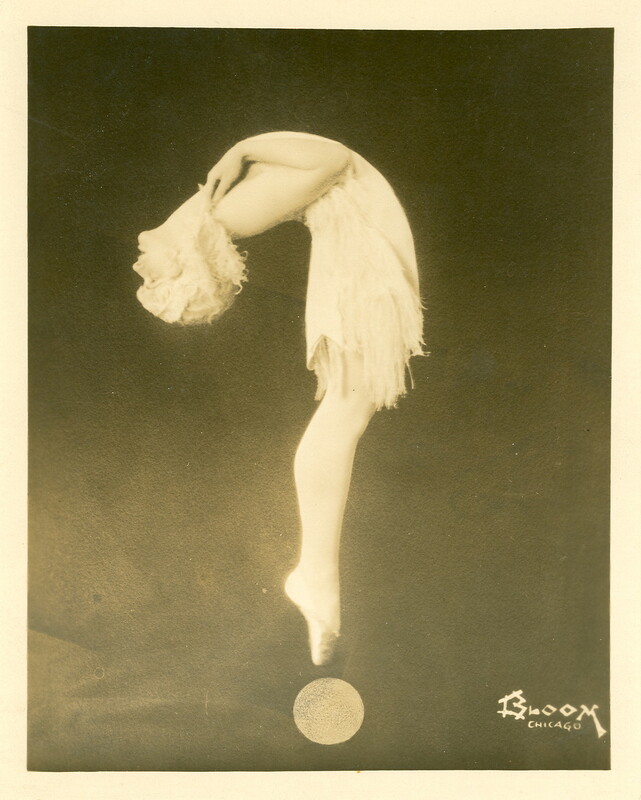 Yet British art during the early twentieth century was certainly not lacking in dynamism. British Modernism, therefore, demands a different interpretation to the wider movement, rooted as it is in the traditions, society, history and culture of Britain as an independent nation. Art reacts to political events or social conditions, but reacts in a way consummate with the national character. Thus it seems entirely appropriate that following the horror of the First World War and the accompanying disillusionment experienced by those who survived it, the British sense of humour should prevail. Accompanied, of course, by a quiet celebration of the enduring British landscape. In a subtle manner, as is customary to the British disposition, these were the means by which British Modernism made its subversive voice known in the years immediately following the war. 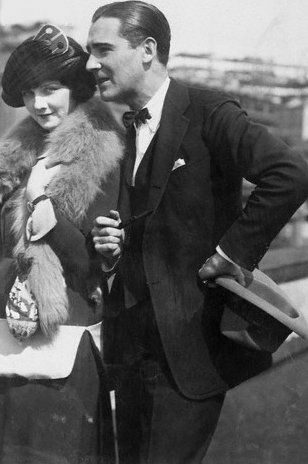 Douglas Goldring, assessing the attitude of young British artists in the 1920s, concluded that the hostility of public and press bred in them ‘an affected arrogance, which is an inevitable result of real or imagined “persecution”’ – and this led to a ‘vein of mordant satire.’ Those whose careers had been cruelly interrupted by the war – such as Wyndham Lewis, once leader of the radical Vorticist movement, left artistically isolated in the Twenties – were understandably disaffected and their paintings appear hard-edged, tainted with bitterness [Lewis, ‘Tyros (A Reading of Ovid)’, 1920-1, left]. 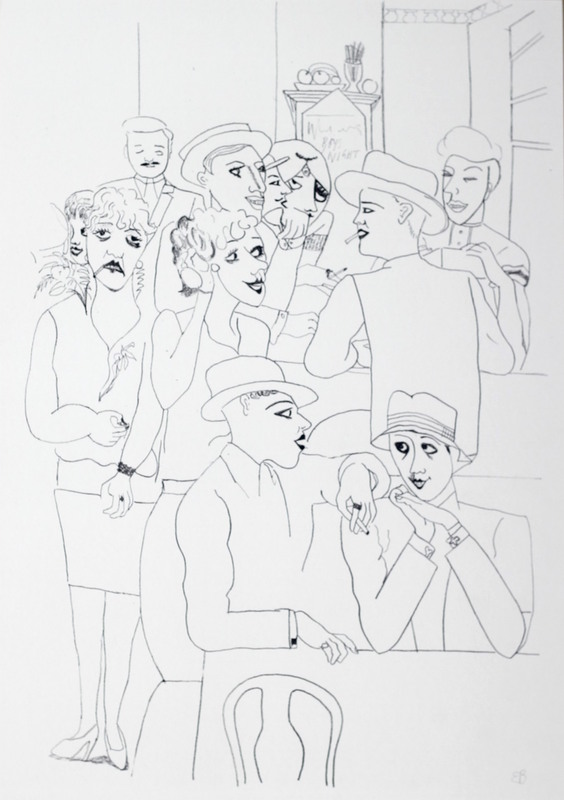 However, the satirical strain of modernism developed beyond this initial reaction, younger artists picking up its thread and creating modernist satirical works that were light-hearted and mocking – and, most importantly, radically contemporary in their style, technique and topical subject matter. 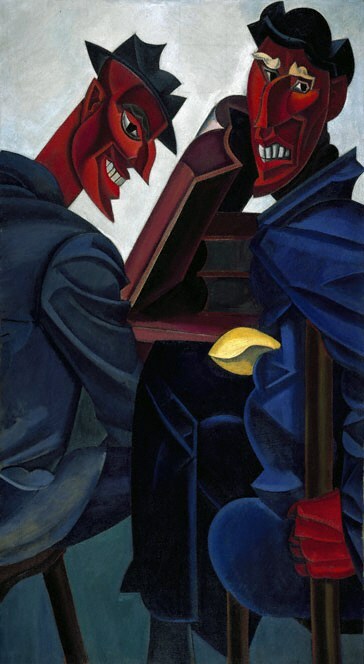 Satire’s traditional function is a moralistic one, the correction of social vices through ridicule; in the context of the 1920s, when accepted moral values were being challenged and rejected, leaving codes of behaviour uncertain, satire was a weapon of moral ‘rearmament’, an undermining of punitive censorship and political cant. 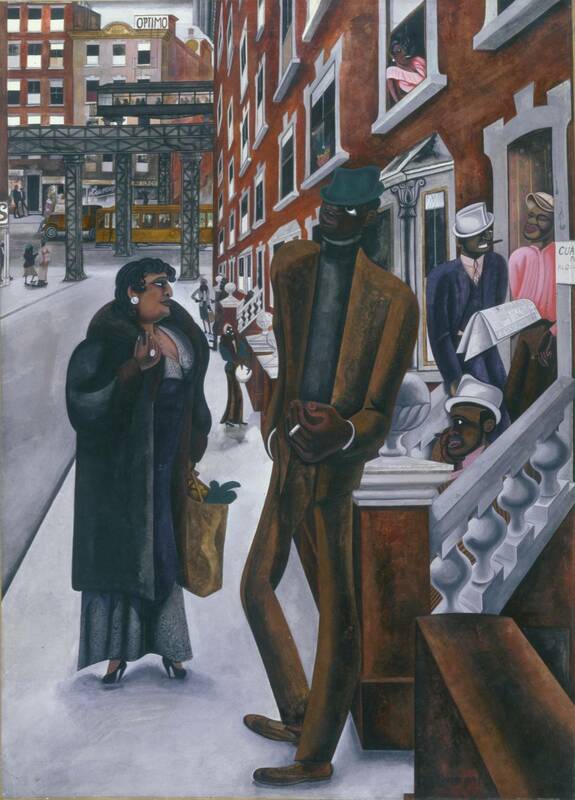 Satire in this sense counterbalanced with ridicule the mood of fear and mistrust that permeated the post-war years. It cannot be claimed that a comparable climate of fear or instability exists today; however, the mode of satire has persisted within British art, mutating to address the prevalent issues of each subsequent generation. And it seems to be making a quiet but marked renaissance among contemporary British artists. Where once the cinema and jazz music were considered dangerously decadent, a modern ‘opiate of the people’, today these anxieties are directed towards the internet and technology advancing beyond our control, by the unseen yet ubiquitous threat of jihadists and drones. In response, a number of artists have chosen to address these issues by using the traditional forms of painting and drawing to make a satirical comment on today’s society. Edward Burra came of age in the early 1920s, the war a constant backdrop to his otherwise quiet middle-class upbringing at Springfield, Rye. His work from this decade draws on the muted dissent of modernist satire – indeed his friend and mentor Paul Nash dubbed him ‘the modern Hogarth’. 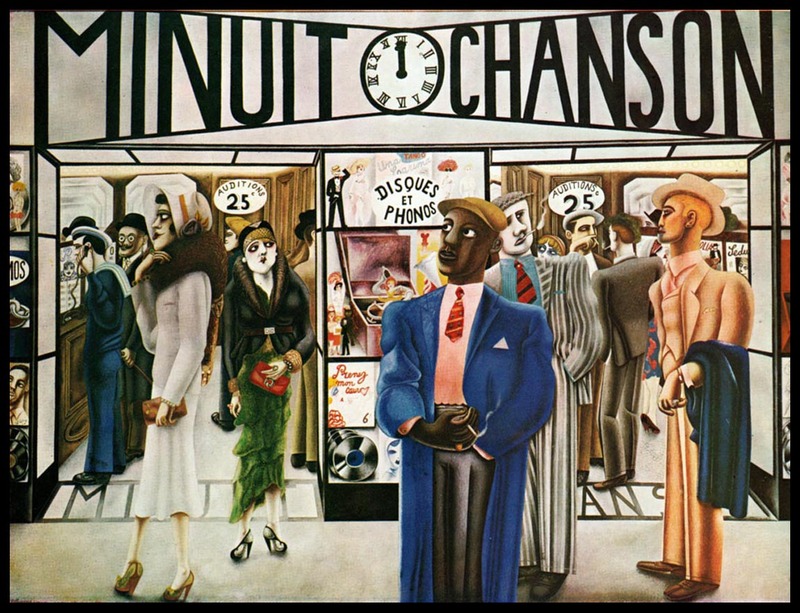 His paintings are concerned with the surface of things, detached from their subject matter, depicting a false gaity that masks – both literally and metaphorically – a seriousness and anxiety so ubiquitous that it was, consequently, deeply unfashionable [Burra, ‘Minuit Chanson’, 1931, above]. 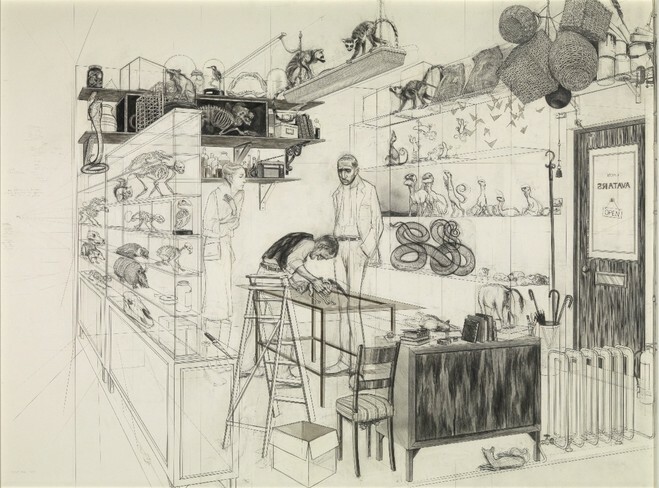 Burra’s work is determinedly awkward to classify – a fact he no doubt revelled in – and this may go some way to explain why he has been for so long overlooked as a important figure in British modernism. As Jane Stevenson argues, Burra is ‘a considerable complication in the story of English modernism’, a far cry from those modernist icons such as Ben Nicholson who were neo-classical ‘in the sense of being restrained, cerebral and strongly dependent on design’; she describes Burra in contrast as a ‘baroque modernist’ [Burra, ‘Dockside Cafe, Marseilles’, 1929, left; and ‘Harlem’, 1934, below right]. This terminology is a useful way to approach British Modernism as it bifurcates, describing more than simply the figurative versus the abstract, or design versus narrative. 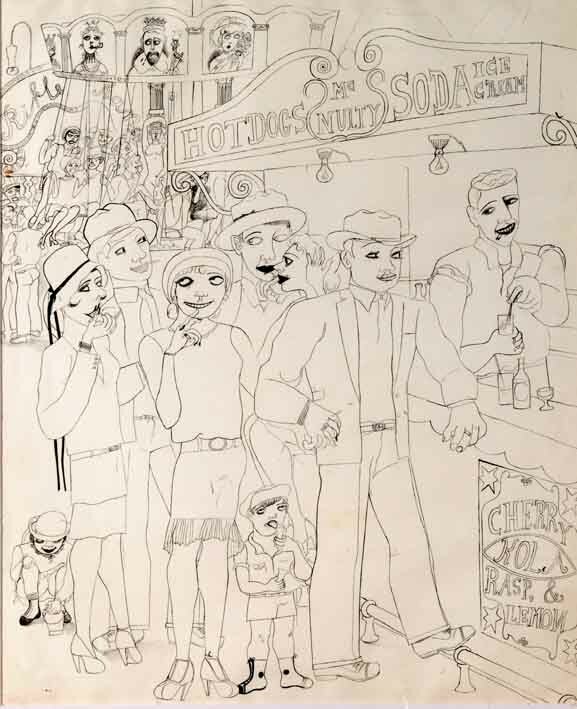 The term ‘baroque’ hints at the anti-classical elements of humour and bad taste, as well as a new focus on modern urban life, that Burra’s works embodies. Attempts were made to involve him with British Surrealism – Paul Nash encouraged him to join Unit One in 1933 and Burra showed with the British Surrealists in 1936; but on a wider European basis, Burra’s work seems to correspond better in style, subject matter and socio-analytical purpose to the New Objectivity movement in Germany in the Twenties. The title New Objectivity (or Neue Sachlichkeit) suggests an anti-metaphysical and anti-romanticist mentality, a matter-of-factness, and its characteristics have been variously defined as a sharp focus, inexpressive brushwork, unified and undramatic lighting, and often an unnaturally close standpoint; Richard McCormick describes it as ‘a “sober” and unsentimental embrace of urban modernity’, open to ‘modernity and mass culture.’ New Objectivity – and its best-known representatives such as Otto Dix and Georg Grosz – has come to symbolise in visual terms the culture of Weimar Berlin. 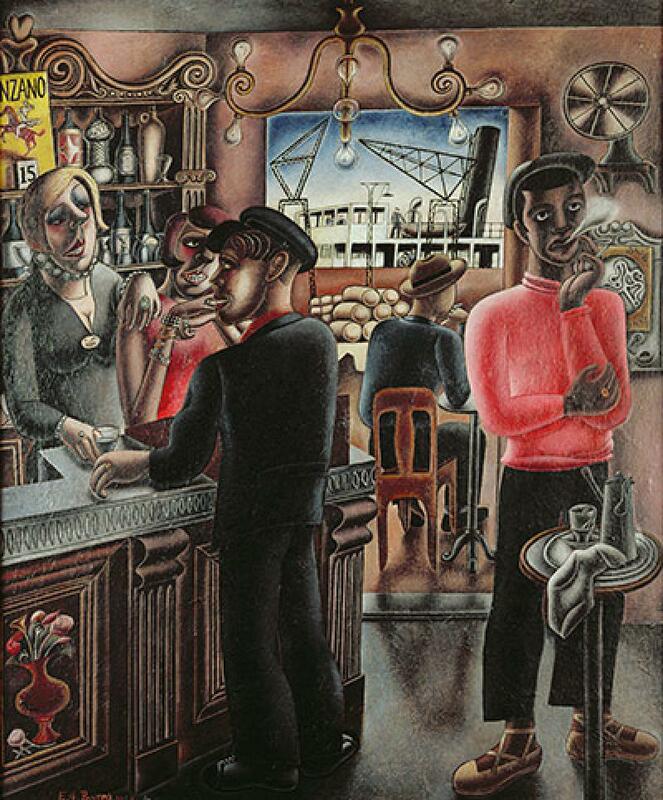 Burra’s use of similar tropes to represent the popular culture of post-war London, Marseille or Toulon should therefore be valued more highly as a critical modernist statement. Charles Avery is one contemporary artist working in Britain who has inherited this legacy of British Surrealism and New Objectivity-influenced artists such as Burra [Avery, ‘Untitled (Expedition)’, 2012, above, and ‘Ceci nest pas un Bar’, below; Burra, ‘Funfair’, 1928-9, right]. 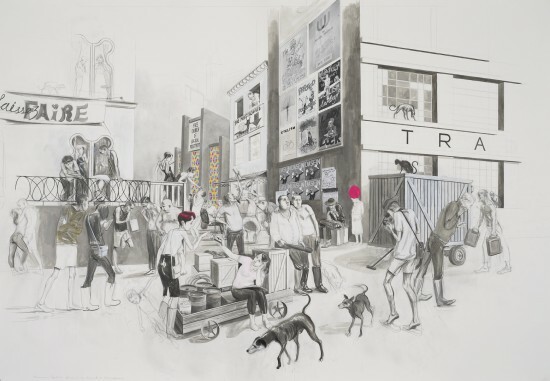 He works predominantly in pencil with splashes of colour; his scenes from the lives of ‘The Islanders’, an ongoing project, portray frozen moments in a parallel society, the narrative ambiguous. 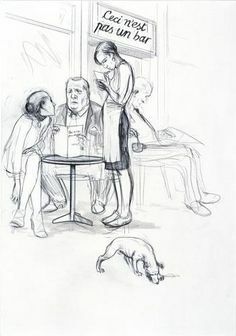 An early review describes his ‘anachronistic style of drawing’, with its air of detachment and irony that signal it as a satire. 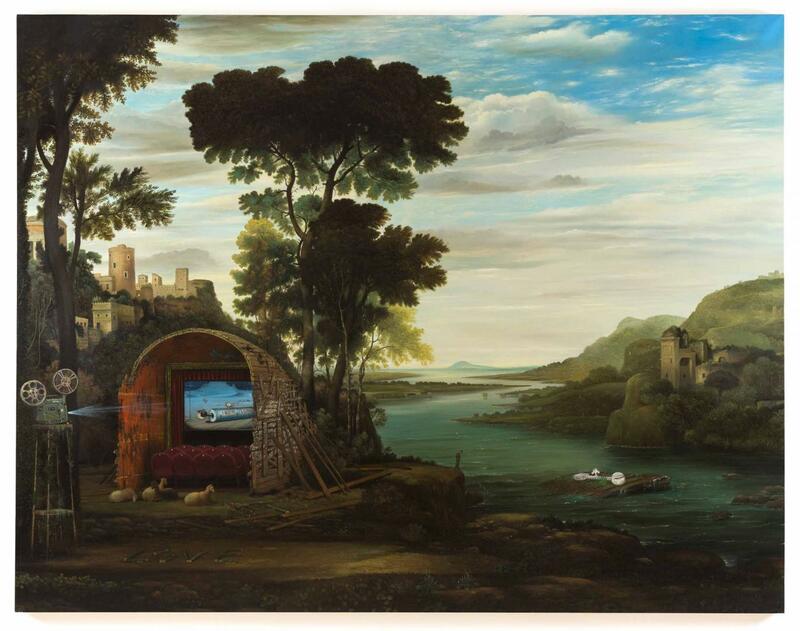 Though ‘The Islanders’ project depicts a fictional and allegorical world, its similarities to our own give its subtle satire a force akin to Burra’s, while the moral aspect suggested by the allegorical ‘history’ of the Island provided by the artist is an essential element of all satire. The characters embody various principles and propositions, not caricatures but philosophical types – in the same way that Aldous Huxley’s characters in his early satires represent different intellectual points of view. In this way Avery combines the surreal and the real of an easily recognisable contemporary reality that provokes a very British self-deprecatory humour. 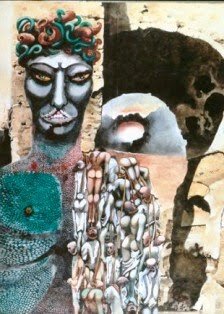 It is an approach deeply rooted in the painting of Burra or William Roberts, and the writing of Evelyn Waugh, Aldous Huxley or Anthony Powell in the 1920s. 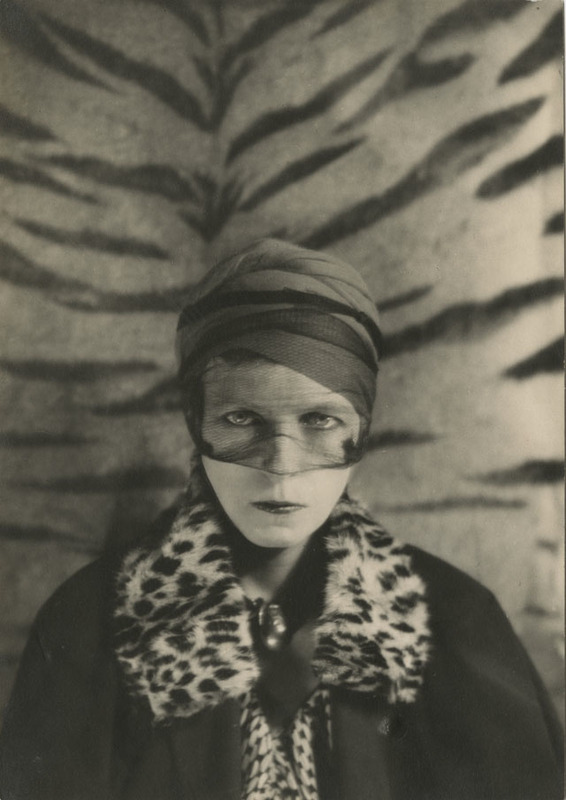 Meanwhile, Avery also inherits some of the theatrical zest of Cecil Beaton and Stephen Tennant. In the eccentric fashions and the figures’ placement within scenery that resembles stage set designs, a parallel reality is created that echoes back our fetishes and foibles, making them utterly ridiculous. Rex Whistler, a friend and contemporary of the Beaton/Tennant coterie and the same age as Burra, achieved a similar effect. 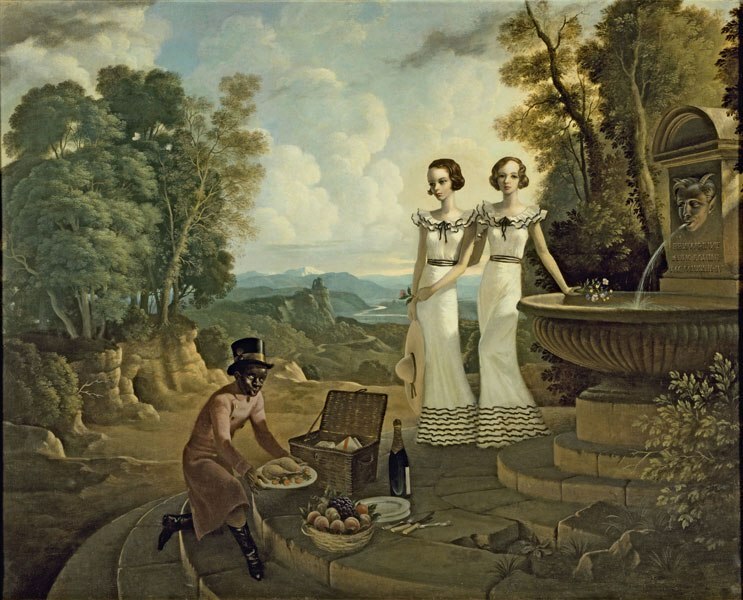 In his mural for the Tate Restaurant, ‘In Pursuit of Rare Meats’ (1926-7) and in his double portrait of the Dudley Ward sisters [1933, below], for example, he uses the classical landscape backdrop of a Claude Lorrain painting, then inserts comedic or incongruous characters, both contemporary (in the case of the sisters) and entirely fictional (the caricature of a black servant who seems to belong to a Firbankian world of fantasy and innuendo). Like Avery, whose own name appears on the door in ‘Avatars’ [2005, above right], Whistler is sometimes tempted to portray himself in his imaginary world – here in the guise of a satyr spouting water from a Watteau-esque fountain, leering with unashamed desire at the beautiful Penelope Dudley Ward. Whistler’s incongruous insertion of elements of modernity into the idealised landscapes of Claude is also echoed by Ged Quinn. Born in 1963, Quinn grew up during a period of intense technological progress that was in many ways as disorientating as the twenties must have seemed. Such inventions intrude on his peaceful landscapes with an absurdity that underpins the humour of satire. 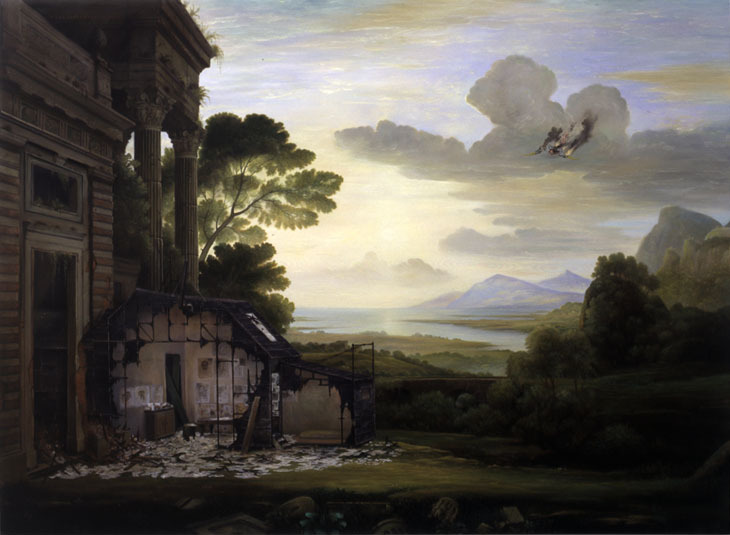 In ‘The Fall’ [2006, left] the figure of Antonin Artaud falls from the sky like Icarus or Lucifer, hurtling towards the burnt out remains of Edison’s ‘Black Maria’, the first ever movie production studio, looking forlorn and vulnerable next to the majestic classical ruins that loom over it. Similarly, in ‘Dreams of Peace and Love Gradually Giving Way’ [2006, below right] a makeshift cinema has been constructed in another Claudian landscape, with a spacecraft from Stanley Kubrick’s ‘2001: A Space Odyssey’ floating on a raft. The flotsam of defunct technology? A mockery of human striving? As Whistler’s characters frolic and picnic extravagantly in a historical landscape that does not belong to them, so Quinn’s figures and structures find themselves stranded in romantic paintings, forlorn and ineffectual. In both cases, the contemporary insertions subvert the traditional British landscape tradition, and, out of context, are simultaneously rendered ludicrous. The British sense of humour was tainted by disillusionment in the 1920s and, in combination with an intelligent and incisive analysis of contemporary society, created a new form of visual and written satire. In today’s art, the same attitude of cynicism and caustic wit, sophisticated yet anarchic, is clearly present. And not only in the artworks themselves but also in the elaborate hoaxes that send up the art world itself. 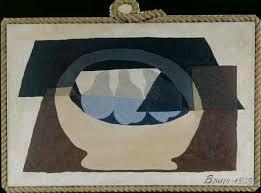 In 1929, Brian Howard, together with John Banting and Bryan and Diana Guinness, organised an exhibition by a mysterious artist named Bruno Hat, duping the critics with their ironic synthetic cubist compositions in distinctive rope frames [below]; in 1998 the writer William Boyd, along with David Bowie, Gore Vidal, Karen Wright and John Richardson presented a hoax biography of an abstract expressionist artist named Nat Tate. 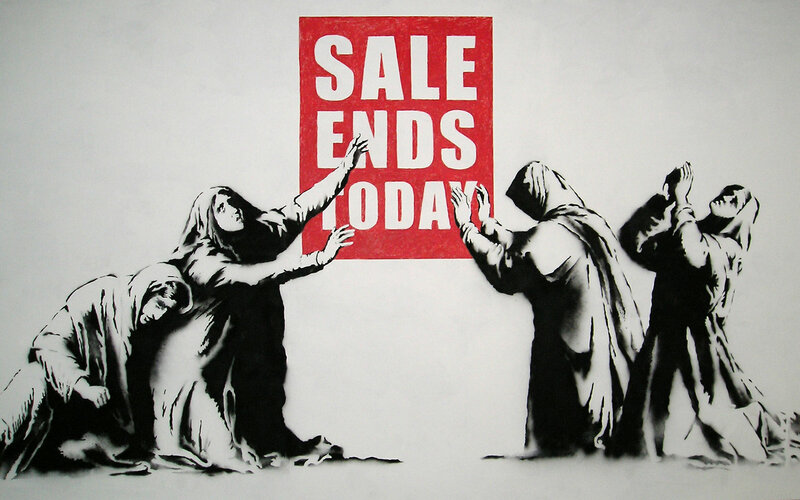 One could also claim that the work of street artists like Banksy are contemporary satires. The works themselves highlight essentially serious issues such as racism, war or police violence in a witty and amusing manner; but what’s more, the fact that the originals are painted onto public structures simultaneously undermines the position of the art gallery as well as questioning the value or ownership of a work of art. Graffiti images of the Mona Lisa with a rocket launcher or the grieving Madonna figures in ‘Sale Ends Today’ [2006, below] are a perfect example of the British modernist legacy: an appreciation of our artistic heritage in incongruous juxtaposition with contemporary symbolism, and a dash of mischievous and often inflammatory wit. Very British – and still bang up to date.